These Hasselback Fried Green Tomatoes make a delicious side dish or appetizer, and the addition of marinated mozzarella takes them over the top! The temperatures plunged last week, signaling an end to my summer garden. While most of the herbs and flowers did okay, the tomato plants couldn’t handle the frost. Naturally, none of the fruits on the vine were anywhere near ripe. That’s fine, though, because I love fried green tomatoes! Since I also had several red bell peppers ready to pick and was going to be in the kitchen anyway, I decided to roast a few. I’ve talked about how to roast red bell peppers for use in Homemade Pimento Cheese, which I’d initially thought about making, too. Then it dawned on me: why not put fried green tomatoes and roasted red bell peppers together? I don’t really understand how that kid’s mind works, but it comes up with some fantastic ideas at times. This was no exception. It was a very delicious suggestion. Marinated Mozzarella is something I like to keep on hand. It’s easy to make and very versatile. I scatter cubes of it on tossed salads or slip slices into an omelet for breakfast. Topping a Margherita Pizza with it turns a delicious dish into one that’s divine. Want a quick and elegant snack? Rub half a garlic clove over baguette slices and top each with a bit of marinated mozzarella then broil for a satisfying yet straightforward crostini. Or, do as I did, and slip it between layers of fried green tomatoes and freshly roasted red peppers for a mouth-watering side dish or appetizer that looks as good as it tastes. Use fresh mozzarella, the kind sealed with a bit of liquid, and not the low-moisture kind you grate. Fresh mozzarella is creamy and soft, and when marinated it quickly takes on flavors from the spices and olive oil. Using the type of mozzarella you’d slice or grate will change the character of this dish and you’ll be sad. Start marinating the mozzarella before continuing with the recipe. This gives it plenty of time to absorb the flavors. If you have extra mozzarella when you’re finished, use it in one of the ways mentioned above. 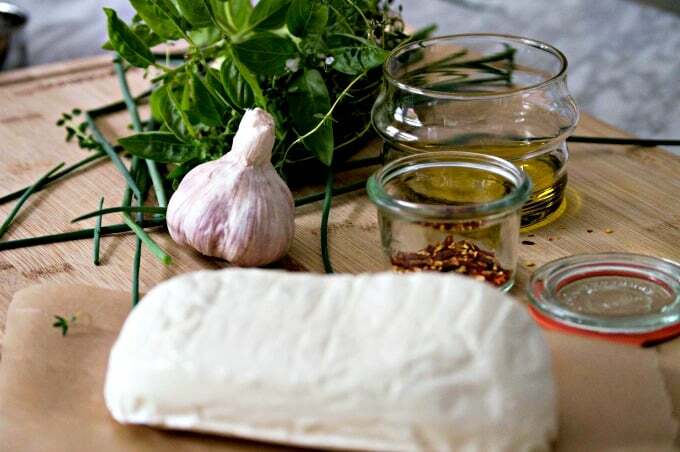 Marinated mozzarella keeps well in an air-tight container in the refrigerator for up to 5 days. Be sure to salt your Hasselback Fried Green Tomatoes as soon as you remove them from the oil. I don’t mean just passing a salt shaker over the things, either. I mean salt it — most home cooks don’t use nearly enough seasoning then wonder why their food doesn’t taste like it came from a restaurant. That’s why! Finally, don’t try to save the leftover fried green tomatoes. They’ll never be as delicious and, really, when green tomatoes are all that’s left on the vine, it’s time to let the flavor of summer go. 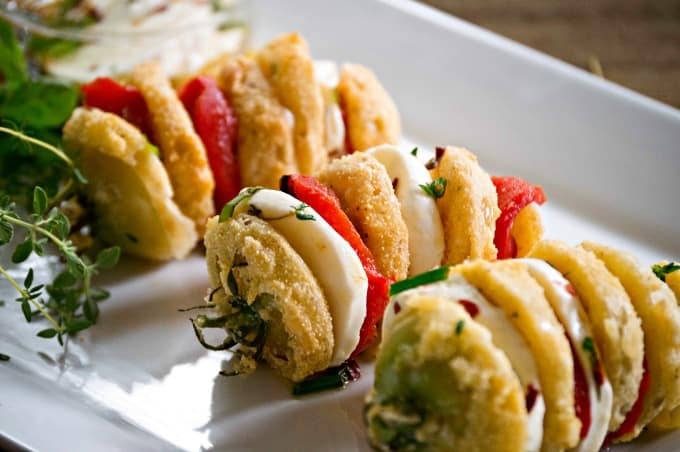 Crisp and tangy fried green tomatoes stuffed with slivers of roasted red pepper and creamy, marinated mozzarella. A spectacular side dish or hearty appetizer to savor the last tastes of summer. 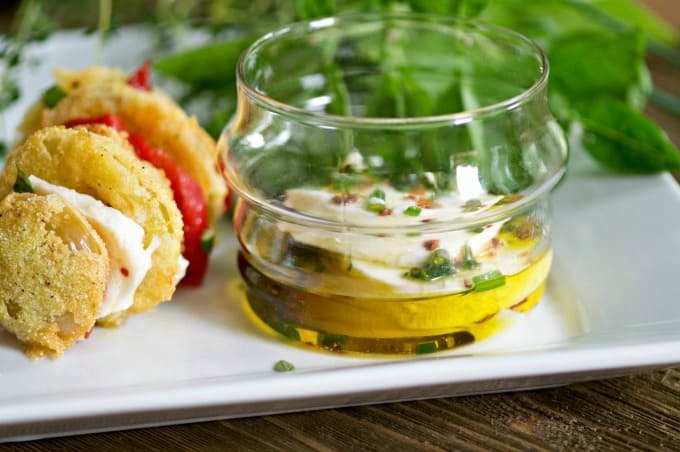 In a small cup, combine the olive oil, red pepper flakes, and minced herbs. Cut the mozzarella into 1/4 inch (0.6 cm) slices and arrange them on the bottom of a casserole dish. Cover with the spiced oil and set aside to marinate. Combine the milk and egg in a shallow bowl. Set aside. On a plate, combine half the flour with the cornmeal, salt, and pepper. Stir well. Pour the remaining flour onto a separate plate. Slice the tomatoes into 1/4 inch (0.6 cm) slices. Dip each slice in the plain flour then into the egg mixture and, lastly, into the flour-cornmeal mixture. Set on a baking rack to allow the coating to adhere. Pour oil to 1/2 inch (1.25 cm) deep in a large skillet over medium-high heat. Heat oil to 375°F / 190C° or until a pinch of flour dropped into the oil sizzles. Add tomatoes in batches, leaving room between them so they don't touch, and cook for 2 minutes per side or until golden brown. Remove from oil with a slotted spatula and drain on paper towels, salting heavily and immediately. Once all of the tomatoes are cooked, assemble the Hasselback Fried Green Tomatoes by alternating layers of tomato, marinated mozzarella, and roasted red pepper. Garnish with additional minced herbs if desired. Pair with a simple roasted chicken or grilled steaks with homemade Montreal Steak Seasoning for a delicious company-worthy meal. Want to save this recipe? Pin this to your Appetizers board! How long do you marinate the cheese for, and how long would it stay good in the refrigerator? My hubby loves fried green tomatoes. I’ll have to share this with him as he is also a good cook and would probably love this too! Thanks for sharing with us at Merry Monday. We love Fried Green Tomatoes and this is a fantastic recipe. I am pinning this one! Thanks so much for sharing your awesome post with Full Plate Thursday. Have a great weekend and come back to see us real soon! OH MY GOSH! 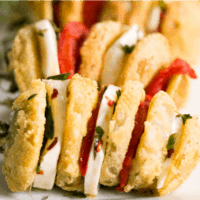 I love fried green tomatoes and these look delicious! Thanks for sharing the recipe. Yum! I live in the South and have the opportunity to order Fried Green Tomatoes at restaurants a lot. However, I have never seen them served like this. I’ll definitely try them out. Thanks. Pinned.